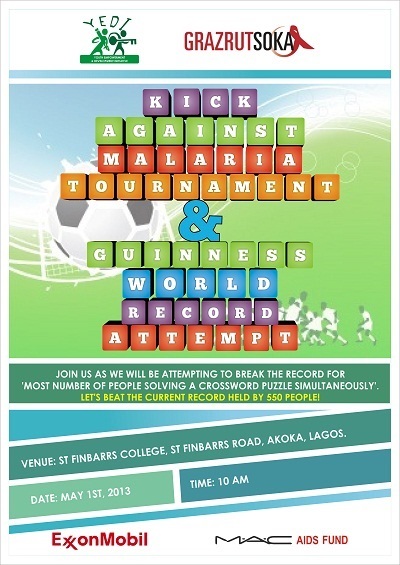 Grazrutsoka, a HIV/AIDS and Malaria program coordinated by Youth Empowerment and Development Initiative (YEDI), is organizing a football tournament and Guinness World Record attempt to mark World Malaria Day. VENUE: St FINBARRS COLLEGE, St Finbarrs Road, Akoka, Lagos. Malaria is the cause of over 300,000 deaths every year in Nigeria. Grazrutsoka through its ‘Skillz Naija’ curriculum has carried out intervention for over 5,000 children in over 100 schools in Lagos state. Skillz Naija is a culture, mind-set, and toolkit for educators to use when teaching young people about Malaria and HIV/AIDS prevention and life skills. It creates simple but powerful connections between soccer and life skills. The ‘Kick against Malaria Tournament’ is sponsored by ExxonMobil and is associated with other exciting activities all geared towards fighting malaria effectively. Along with the tournament, there will be Malaria Testing and Treatment; Mini Clinic; Bed Net Distribution etc. The matches will be played for thirty (30) minutes each, and the winners will emerge (male and female team) and be awarded trophies and prizes for all participants. There will also be an attempt to break the record for the ‘Most Number of people Solving a Crossword Puzzle Simultaneously’, themed “Cross Out Malaria”. The current record stands at 550 people, set by University Students in Indonesia. We hope to break this record by having 1,000 people solving a puzzle at the same time. All of the activities are geared towards spreading awareness about malaria, and to get more people to take proper actions to fight the disease. Youth Empowerment and Development Initiative (YEDI) is a Nigerian NGO committed to introducing effective and innovative approaches to educating, empowering and inspiring people and communities in Nigeria. YEDI through its programs helps young people have relevant and important discussions about life, take small steps to achieve their goals, stay strong when faced with challenges, and protect themselves and others from diseases such as HIV/AIDS and Malaria. now than before and have changed my tastes. it isn’t fully cough free), by four pianists: Elisabeth Bergmann, Marcel Bergmann, Sandra van Veen, and Jeroen van Veen.